We haven’t blogged about budget weddings for a while, but it’s always a hot topic in the ABC office. It’s a common issue that couples want to get married but feel held back by the cost of The Big Day, however there are many ways to make your wedding ceremony and reception affordable without seeming cheap! As we mentioned in Wedding Planning on a Budget, a glamorously dressed marquee venue can be as luxurious as a fancy hotel, while seasonal wedding packages can be the perfect answer to save money but still have the venue of your dreams. Don’t increase your wedding expenses with our wooden floor or carpet options if your guests are bound to go barefoot, don’t have a marquee floor at all, as your wedding reception can be held straight on the grass! Confident in the weather? 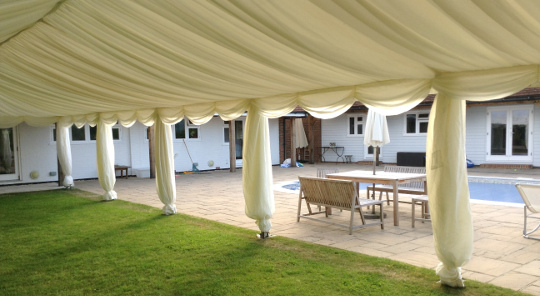 We offer roof-only marquee hire, saving many pennies on hiring and constructing the sides. Always look for special offers and marquee wedding packages! Shot-gun wedding? Book a marquee with us during the next 6 weeks – for celebrations on or before Monday 30th May 2016 – and you’ll receive an immediate 20% discount on marquee hire*! Another fantastic aspect of a festival style wedding on a budget – or a glamorous marquee wedding venue in the countryside, if you prefer – is that it may be possible to arrange overnight camping or glamping for you and your guests, or even stay the whole weekend. ABC Marquees can arrange marquee wedding venues with camping at a choice of beautiful locations in Sussex, and it doesn’t need to be a “proper” campsite as we can provide mobile toilet hire too. Please contact Julie on info@abcmarquees.co.uk if you would like to find out more about our services, including wedding marquees, canopies and Bedouin tents, or fill in this short form for a guide to our marquee hire prices.